We are excited to announce the next IDWG talk at UC Santa Cruz. 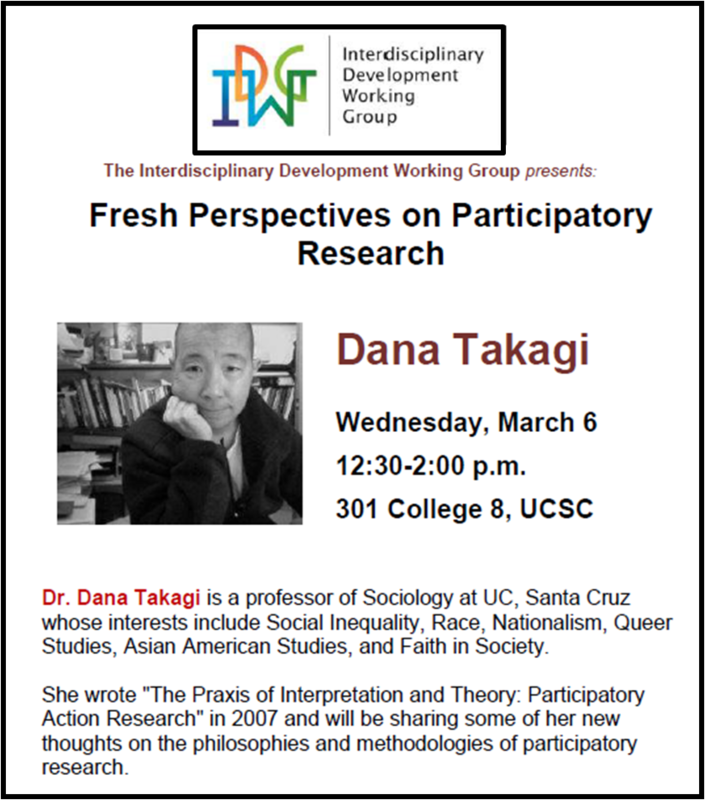 Dr. Dana Takagi will discuss her research on participatory methodologies this Wednesday, March 6th from 12:30 pm to 2:00 pm in College Eight, Room 301. Anyone interested is welcome to attend. Dr. Dana Takagi is a professor of Sociology at UC Santa Cruz whose interests include Social Inequality, Race, Nationalism, Queer Studies, Asian American Studies, and Faith in Society. She wrote “The Praxis of Interpretation and Theory: Participatory Action Research” in 2007 and will be sharing some of her new thoughts on the philosophies and methodologies of participatory research.